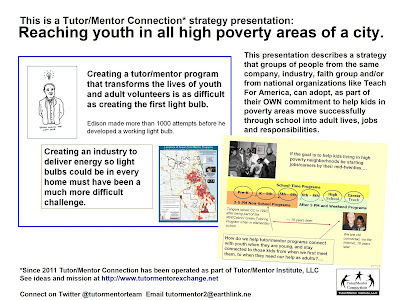 Tutor Mentor Institute, LLC: Helping Youth Through School - Do These Ideas Interest You? Helping Youth Through School - Do These Ideas Interest You? 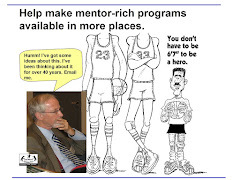 If you do a Google search for "tutor mentor connection" then look at the images page, you'll see dozens of graphics that I've put in articles on this and other blogs over the past 15 years. You can click on any of those and go back to the article where they were used. Ideally, thousands of people would be doing that. In this article I'm going to show a progression of ideas, visualized with graphics. I hope you'll follow along. The goal: Reaching k-12 youth in all high poverty areas of Chicago, or other regions, with mentor-rich programs that help kids through school and into adult live, jobs and careers. 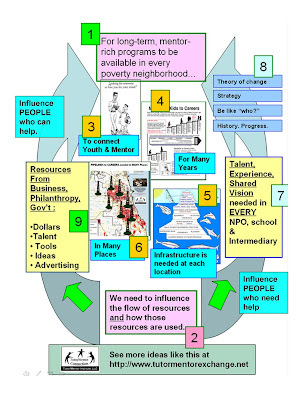 This graphic combines the understanding that building and sustaining great programs in thousands of places is not easy. Drawing youth and volunteers into these programs and keeping them involved for many years is also not easy. It requires persistence and constant innovation. It also requires a constant source of funding, to attract and keep talented people involved in this effort. 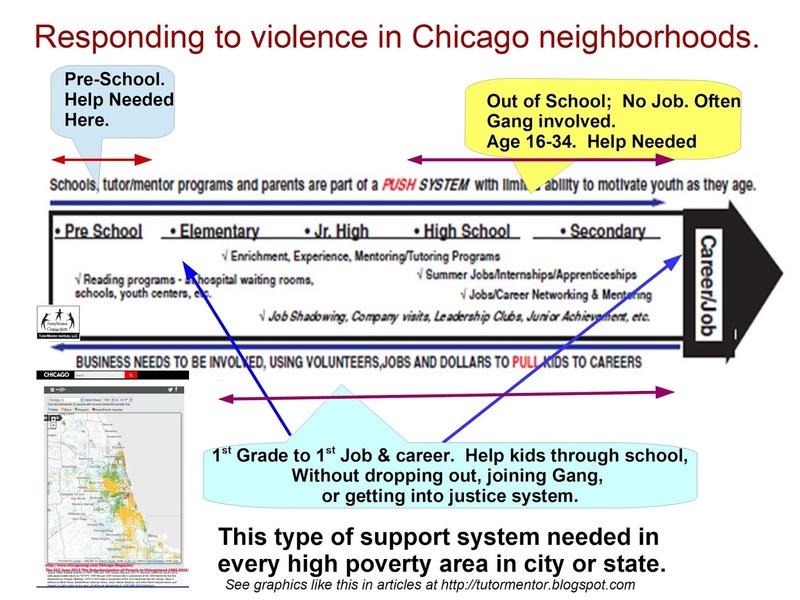 Comprehensive response to indicators of need, such as high levels of violence in some neighborhoods. It was just announced that the Youth Guidance Becoming a Man Program, in partnership with Thrive Chicago, and Chicago Public Schools, received a major grant from the Obama Foundation. That's part of a huge effort that focuses on youth and young adults who are in a high risk "opportunity youth" profile category. However, unless investment is made in programs that reach youth earlier, to help them through high school and into college or other post HS education, help them aspire to jobs and careers, and help them avoid the negative influences surrounding them, there will always be a new wave of youth coming into the high risk pool. Planning needed, in Chicago, and in every other city. This concept map contains a lot of information. At the right is the same graphic that was included in the first graphic shown above. 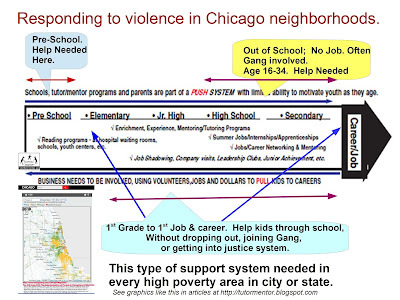 Then there are maps, showing high poverty areas of Chicago. All of these areas need great programs reaching kids from first grade through first jobs and on-going careers. In the middle is a chart that shows stages of planning. Steps 1 to 7 are shown in this article. Step 7 talks about the need to build and sustain public will, for many years, to mobilize needed resources to make great programs available in many locations. Maps are a key part of all of the strategies I've shared for the past 25 years. A map shows all of the places in a city where kids, families and schools need extra help. It can also identify potential partners to support youth development and education efforts. And, maps can be used to show the distribution of needed resources, so that planners can adjust marketing activities to draw more resources to under-funded, and under-served areas. Influencing actions of resource providers, not just non profit organizations. That's the graphic shown at the far left of the planning map, and also shown below. 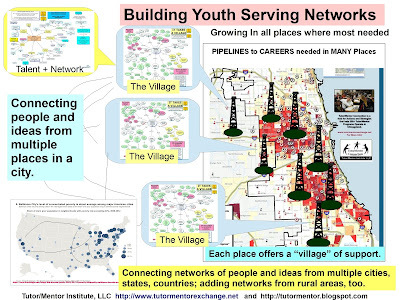 Without providing a consistent, on-going flow of talent, ideas, dollars and other resources to EVERY youth program operating in Chicago and other cities, it will be difficult, if not impossible to build and sustain the needed programs that result in far greater numbers of youth born in poverty areas being in jobs and starting careers by their mid to late 20s. 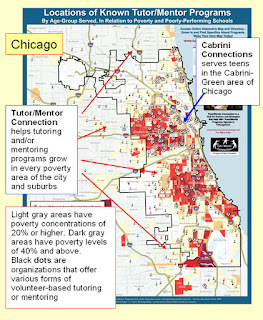 In one section of the Tutor/Mentor web library I point to articles that show challenges facing the non-profit sector. Toward the bottom left side of this blog I point to a few of the web sites that are included in my library. One is the From Poverty to Power, a UK blog, which featured stories yesterday, and today, that show challenges of building comprehensive solutions to complex problems, along with some suggested improvements on the existing system. 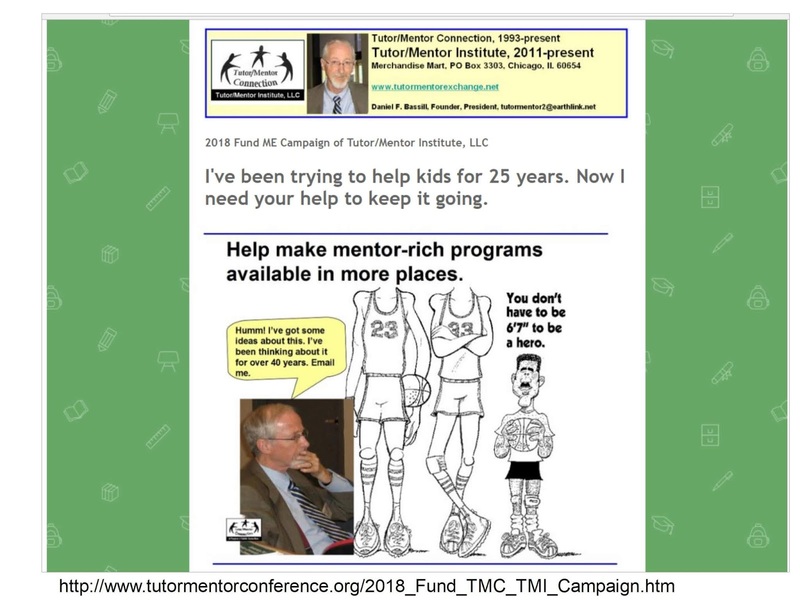 I've been trying to find a champion that would support my innovations in this effort ever since launching the Tutor/Mentor Connection in 1993. Here's an article posted on PCWorld magazine in 2009 by someone who had spent time getting to know me in the previous years. He included me in a list of people he recommended for MacArthur Foundation Genius Awards. Not only did I not get nominated, but that was the second year of the financial meltdown of the late 2000s. 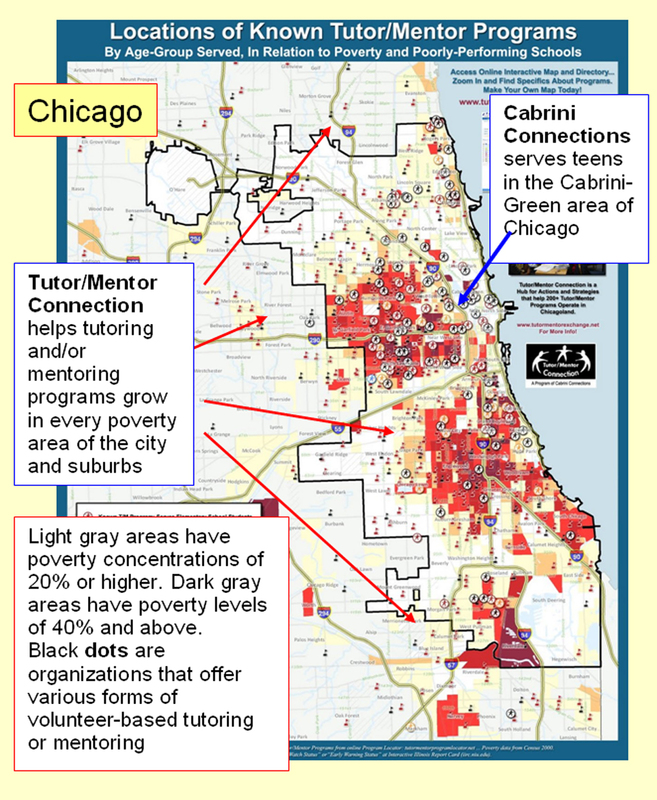 It's the primary reason that I had to create the Tutor/Mentor Institute, LLC in 2011 to try to keep the Tutor/Mentor Connection available to Chicago. If you like the ideas I'm sharing, visit my FUNDME page and send me some financial support. If you're one of the 1% and want to become my benefactor, to assure that these ideas go forward past my own lifetime, then look in your mirror and decide how, and how much, you want to help. 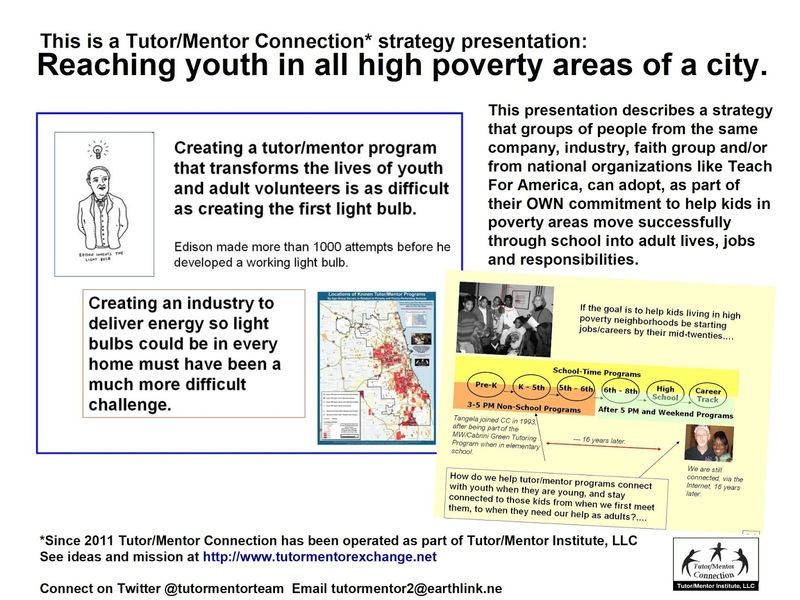 I'm on Twitter, Facebook and LinkedIN and can be reached at tutormentor 2 at earthlink dot net. I hope to connect with those who understand how important these strategies are.